A large area of Russian Land law concerned with registry the ownership of right of land, this body includes some Laws and Regulations, the main of them are the Law “On the State Registration of Rights of Ownership of Immoveable Property and Deeds to Immoveable Property”, the Law “On the State Immovable Cadastre” and Regulations “On assertion of the parcel plat form and demands to its preparing and on meeting notification with regard to adjustment of parcels boundaries establishing” (the Regulations). Nowadays the Federal Office of the State Registry, Cadastre and Mapping (the RusRegister) deals with registry the ownership of right of land plot and ascertaining boundaries of parcel. As known, a private boundary – an artificial boundary set up to mark the beginning and direction of a boundary line of adjoining parcels of land. The parcel boundaries must be drawn in the plat map. According to the article 38 of the Law “On the State Immovable Cadastre” the plat map of a parcel of land is drawn up on the bases of the territory’s cadastre map, the topographical map according to the current records of the RusRegister after the parcel has been measured by cadastre engineers. The plat map of a parcel of land must give descriptions of piece of land, its boundary line, adjoining estates, easements and etc. 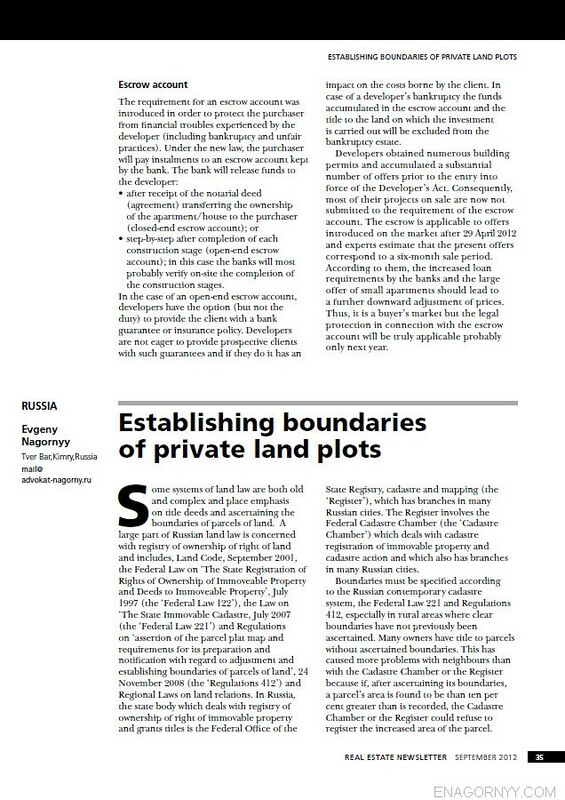 After that, the RusRegister examines title of land, ascertains the parcel’ boundaries and its contents and has prepares and grants to the owner or his mandatory the cadastre passport of the parcel of land that gives a shot description of the parcel with filed the plot map. According to the article 39 of the Law “On the State Immovable Cadastre” and the Regulations the boundaries of contiguous parcels must be negotiated between its’ owners or their mandatory and after the agreement has been made, cadastre engineers may draw the plat map of the parcel of land. The wording of this article dictates obligation to negotiate the boundaries of contiguous parcels in simple written form by signed the act of boundaries conforming e.g. between two or three owners or by arranging the meeting of several owners or other persons having interest in this issue. The dictates of the Law “On the State Immovable Cadastre” and the Regulations with provisions concerning to set up clearly bordering of contiguous parcels seems complete to except the conflict between the contiguous owners, however, it could not have been all plain sailing in practice because of ambiguous legal framework for solving disputes in Russia and lack of recognized court practice. These deficiencies in turn caused problems with the ownership of right of land and generate many social problems. Since 1966 the older peasant woman Ms. Frolkova have possessed of the parcel of land square 4000 sq. meters, the parcel was acquired on the bases of the local authorities’ decision. In 1985 the collective farm built the farm house behind Ms. Frolkova’s parcel of land, it was built of three meters from the line of her parcel of land. In 1992 Ms. Frolkova acquired the ownership of right of that parcel of land according to local authorities’ decision. 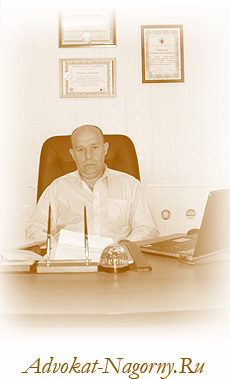 In 1993 Mr. Lysenkov farmer located at the farm house behind Ms. Frolkova’s parcel of land and he acquired the ownership of right of parcel of land square 4 000 sq. meters according to the local authorities’ decision too. The boundary line of adjoining parcels of land belonged to Ms. Frolkova and Mr. Lysenkov had not been defined. In 2003 Mr. Lysenkov brought frivolous action of trespass quare clausum fregit, actually, because of nuisance a very nearness Ms. Frolkova’s parcel of land to his house. Defendants were the local authorities, the collective farm and Ms. Frolkova. However, Mr. Lysenkov hadn’t produced evidence of defendants’ actus reus and Ms. Frolkova’s trespass his parcel of land,then he had stopped to appear at the court sessions therefore the Kimry town court closed the case. It had elapsed and Mr. Lysenkov found the lead. He had made unlawful deal with the Chief of the local authority and the cadastre engineers who drew Mr. Lysenkov’s plat of land map without negotiating the boundaries of parcels with Ms. Frolkova since they decided her parcel of land is not contiguous to Mr. Lysenkov’s plat of land. The Chief of the local authority had signed the act of boundaries conforming. As a result, in 2009 Mr. Lysenkov was granted the cadastre passport of the parcel of land with filed the plot map. The distance between his house and Ms. Frolkova’s parcel of land line became ten meters instead three ones and he was acquired of 1 144 sq. meters of Ms. Frolkova’s parcel of land in his ownership and he destroyed her shed had been located on this part of the parcel. 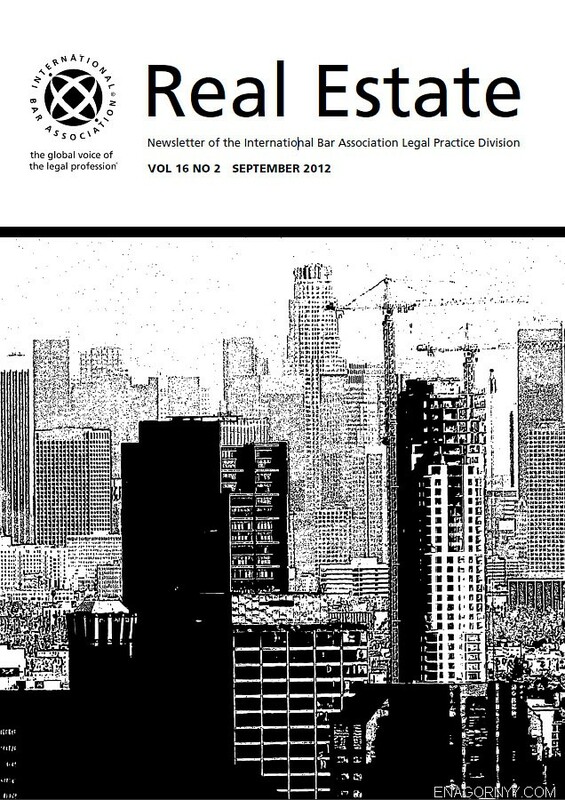 Ms. Frolkova brought an action of establishing the boundaries of contiguous parcels and possessory action. The claims flowing from the alleged misfeasance of the Chief of the local authority and the cadastre engineers on drawing Mr. Lysenkov’ plat map of the parcel of land, the claims were motivated by the dictates of the articles 38 and 39 of the Law “On the State Immovable Cadastre”. The Kimry town court considered whether the defendant’s obligation to negotiate the plot’s boundaries with the plaintiff was owed and took admissible in witnesses’ evidence for the defendant instead of focusing on the rules of the Law “On the State Immovable Cadastre” and Regulations. These witnesses of the defendant gave stated that there had been the lane between the parcels so they weren’t of contiguous ones. The court hadn’t reviewed the territory’s cadastre map, the topographical map and current records of the RusRegister relevant the parcels, albeit to say the least these data are crucial to the case. What’s more, to develop the evidence the lawyer who argued the case in the court for the plaintiff made motion to examine the Chief of the local authority who had been arrested in charge with the other criminal case for bribery, the motion was dismissed. The trial court found the parcels hadn’t been contiguous so there wasn’t obligation to negotiate its boundaries between their owners, the plaintiff’s claim failed. Because of the trail court had failed to observe rules of the positive law, the plaintiff appealed to the higher court. The decision subsequently upheld by the Tver Oblast Court (Appeal Court) and the Supreme Court of Russia. Having sense of injustice Ms. Frolkova had appealed to the European Court of Human Rights. On 28 January 2011 a single judge G. Nicolaou declared that the submitted application inadmissible (the case 65836/10 Frolkova v. Russia). Having closely analysed the court decision it is obviously the one is somewhat inconsistent to the Article 1 (Protection of property) of the Protocol of 20th March 1952 to the Convention for the Protection of Human Rights and Fundamental Freedoms since Ms. Frolkova illegally lost the part of her parcel and the shed was destroyed. Thus one more sticking point is the leverage that ensure to restore the parcel square 4 000 sq. meters that had been rendered Ms. Frolkova by the authorities, and to restore the shed to straighten out her statutory position. In respect of this particular argument, the national courts had been decided on the merits, inter alia stated nothing, therefore the decision is blatantly divergence and biased. In fact, it is a breach of Ms. Frolkova’s right to a fair trial declared by the Convention for the Protection of Human Rights and Fundamental Freedoms (the Article 6). To the top of article "Land Plot Private Boundaries Establishing"